Do You Want to Develop the Same Power, Confidence & Control Possessed by a True Master Warrior? Japan's ancient Samurai and Ninja. Learn the true meaning and definition of the word, "Ninja." Discover the 3 levels & 9 aspects of training in the Ninja's self- protection and personal combat system known as Ninpo-taijutsu. Discover the 3 aspects that make up a true practitioner of Ninjutsu. Get a real blueprint for mastery from an authentic teacher of the "Warrior Ways of Enlightenment." Find out why the "poor farmer" version of Ninja history is a "smoke-and-mirrors" illusion - and why nothing in Ninjutsu is as it appears! Learn why most student's perception of Ninjutsu... is wrong! Discover just a few of the differences between the Samurai and Ninja families - how each thought about life, combat, duty, etc. - and why that's important. Who were the real people from ancient Iga and Koga that we've come to know as Ninja and what were they originally called? Discover the answer to the question, "What is a Ninja... really?" ...then click on the "Instant Access" button at the bottom of the page. 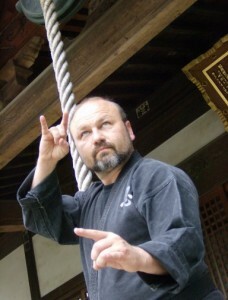 You will then, after you confirm your email address, get immediate Instant Access to the recording of a special online ninjutsu class - well over 2 hours of solid training that I gave to some of my personal online and long-distance training students about the art and practice of authentic, Japanese Ninja training. I will also give you a complimentary subscription to my online ninjutsu training newsletter which will give you even more lessons, tips, insights... and even invitations to special live and online training opportunities with me. I could (and have) easily sell this class recording for its real value of at least $97. So, why am I giving it away to you today for free? The reason is because I know that you may not know who I am, if I'm the real thing, or how what and why I teach the art of Ninjutsu the way I do is different from practically every other instructor and so-called master of the art that you might find. And, I know that the best way to let you find out for yourself is to give you something real - something of value that you can apply to your training right away. Then, and only then, will you know for sure, and whether or not you want to learn anything more from me. If so... great. That's what I'm here for. If not... that's okay too. Simply unsubscribe from any future lessons at any time. © Warrior Concepts Int'l, Inc. / Bujinkan Moki no Tora Dojo - All Rights Reserved. Copyright © 2019 Warrior Concepts International All Rights Reserved.